There are different wedding themes you can consider. It is very common for brides and grooms to choose an outdoor wedding nowadays. However, do you know how to plan this event properly? Let us discuss this issue in detail now! Having an outdoor wedding is wonderful. It is a must to have an alternative plan when you are planning this event. It is impossible for you to predict the weather on your big day. This is why you will need an alternative plan. You should consider having an alternative venue if it is possible. Make sure that you will include the address of this alternative venue on your wedding invitations. You may not need to consider the bathroom facilities when you are planning an indoor wedding. However, the case is different when it comes to an outdoor event. You need to ensure that there will be toilets for your guests. For a summer event, it is essential to provide shade. This is to protect your guests from excessive sunshine. It is not difficult to prepare a tent in your wedding location. There are a lot of contractors in the market. Your decorator may also be able to help you. You should also consider the parking spaces as well! It is common to have the ceremony and reception in the same location. However, there are brides and grooms who may not want to have both event in an outdoor space. You need to consider the distance between the two locations. It will not be a good idea if they are too far away from each other. You may even need to arrange transportation for your guests. Remember, you have to tell your vendors that it is going to be an outdoor wedding. They may have to prepare for it. For example, the photographer will need to prepare extra lighting equipment. This is because the lighting condition may not be good at night. Your caterer also has to find some ways to protect the foods from bugs. 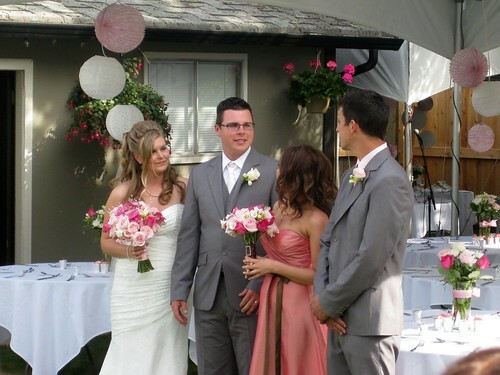 An outdoor wedding location can usually accommodate more guests. This means that the scale of your wedding will be a bigger. It is important to plan the budget very carefully. You will probably need to spend more when you have more guests. Besides this issue, you should also prepare a lot of chairs. This is to make sure that every guest can have a seat. When it comes to the venue decorations, couples will generally agree that they do not need to decorate the venue heavily. It is because the location can already be a very natural and wonderful backdrop for your wedding. The venue is wedding ready. It is ridiculous to put too much effort on the decorations. Usually, an outdoor wedding is not a formal event. This means that you can make things a bit more casual. The dress code of your guests should never be formal. This is something you should keep in mind. It can be strange to have a formal outdoor event! The author of this guest post is Jerry Leung. He designs wedding cards for http://www.983invitation.com/. He also write a lot of articles about wedding planning.